I have a customer and she wants a form with A/B questions. More A is a different result (message) than more B answers. Is it possible to show a different text or send them to a different url with information about there choices? If so how is it possible? 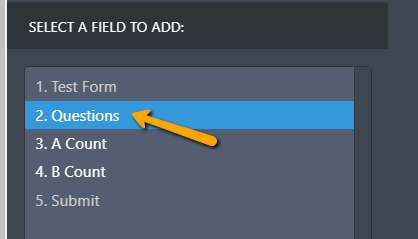 Yes, you can count the number of selected A's or B's by using the Input table field. You can check this sample form that I have created: https://form.jotform.com/73113434110944. On the sample form, I have added an Input Table field for the Question. Then assign a value to be used for the calculation. You can check this guide for instructions on how to assign values on the Input Table Field: How to Assign Calculation Value. 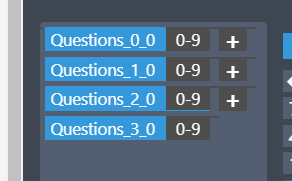 Then add a Form Calculation widget to compute for the selected answers. 2. Select the Input Table Field. 3. Form A Count select all checkbox in Column A. 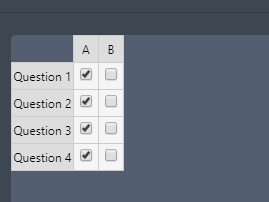 Form B Count select all checkbox in Column B. 4. Add [+] to your formula to sum the values. You can check this guide for more information about the Form Calculation Widget: How to Perform Form Calculation Using a Widget. Then once you have the count for the selected answers, you can use conditional logic to show/hide different text or redirect the user to a different URL. 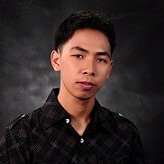 You can check this guide for more information: Smart Forms Using Conditional Logic.